Regular checkups can help keep your child’s teeth clean and cavity free. Schedule an appointment for your child’s exam, dental cleaning and any necessary x-rays for only $45. Trinity Family Dental warmly welcomes children of all ages to our practice. Dr. Timothy Shen is great with kids, and our entire team is invested in making your child’s visit a positive experience. Our home-like office helps your littlest family members feel comfortable — while Dr. Shen’s experience and our advanced technology ensure excellent care. Early preventive care screenings help your child avoid tooth decay — so they learn to like going to the dentist instead of fearing it! We offer affordable dental care without compromising on quality. Call today to schedule your child’s checkup. The American Academy of Pediatric Dentists (AAPD) advises that children be seen for a checkup every 6 months. These visits allow Dr. Shen to closely monitor new changes in your child’s mouth and ensure that you, as a parent, have the information you need to promote continued oral health in your child. Dr. Shen may suggest additional checkups if your child is more susceptible to cavities, or if your child is showing signs of orthodontic problems. Protective dental sealants are thin coats of plastic painted onto your child’s back teeth to protect them from accumulating harmful bacteria. Studies show that 88% of cavities in American school-aged children are caused by food and bacteria being caught in rear molars. At Trinity Family Dental, we typically apply a protective sealant to your child’s back teeth, premolars and molars. Sealants typically last for several years, and we always monitor their conditions during your child’s regular dental appointments. Baby teeth are not as strong as adult teeth. If your child’s tooth suffers a large cavity, the bacteria can damage the pulp inside the tooth, causing pain and inflammation. When the soft tissue inside the pulp chamber becomes infected or inflamed, Dr. Shen might recommend a pulpotomy. Instead of removing the entire tooth, Dr. Shen will put a medicated filling into the pulp chamber to try to keep the remaining pulp inside the tooth alive and healthy. Our experienced dentists all have a gentle chairside manner, helping put our patients at ease. 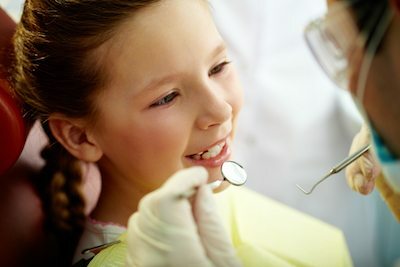 We offer affordable pediatric dentistry and general dentistry services. Give our office a call today to schedule your child’s dental appointment!